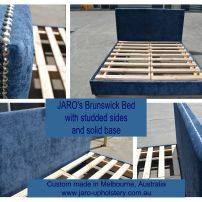 commented on "JARO's Brunswick Upholstered Bed - strong custom made in Melbourne in all bed sizes and colours." JARO's Brunswick Upholstered Bed - strong custom made in Melbourne in all bed sizes and colours. The Brunswick Bed is available in all sizes. 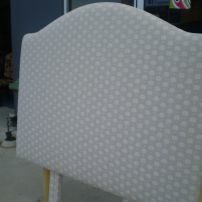 The Brunswick features studs around the border of the bedhead and slats that won't break. 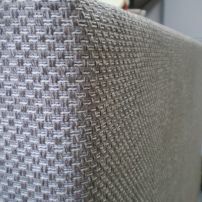 Available in 100s of fabric colours and textures including velvet and linen styles. Click on picture for more info. commented on ""Big Softie" Bed Head"
LOOKING FOR SOMETHING DIFFERENT! NEW DESIGN - JARO's "Big Softie" Bed Head and Base. Available in all sizes and some amazing colours! Colours range from soft colours to vibrant brights! 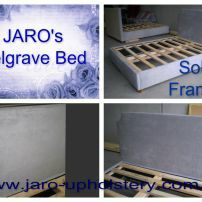 commented on "JARO's Belgrave Upholstered Bed, Melbourne"
The Belgrave is just one of many different styles we can make. The Belgrave can be made in all bed sizes and is available in a large selection of colours and patterned fabrics. Our beds have extremely solid frames to last! 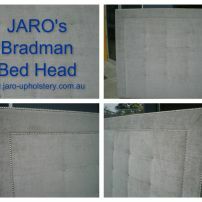 commented on "JARO's Bradman Bed Head available in King, Queen, Double, King Single, Single in Pakenham, Melbourne"
commented on "Custom Made Bed Heads, Head Boards and Bases available at JARO Upholstery, Pakenham, Melbourne"
Can't find that special bed head, headboard and/or base? We can design and manufacture the look you are after! Many styles including soft buttons, stitch detailed, panels, diamond tufting, pin tucked, studded, plain, floral and so much more. 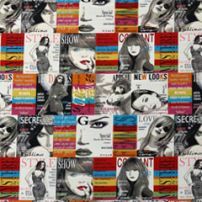 commented on "Stylish Beds for Teenage Girls available at JARO Upholstery, Melbourne"
available in numerous themes including magazines, hearts, too many to list. A must see! 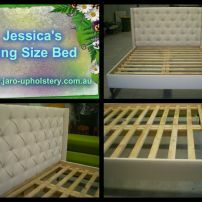 commented on "Diamond Buttoned King Size Bed - Australian Made by JARO Upholstery in Melbourne"
Can't find the bed you desire? We can help you design the bed of your dreams! commented on "The Lucia Bedhead, a Modern Natural Weaved Style. 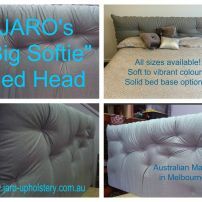 All styles available at JARO, Pakenham, Melbourne"
Can't find that bed or bedhead you desire? JARO can custom make it for you! 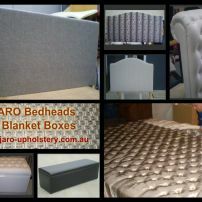 commented on "Custom Made Bedhead & Bases and Blanket Box Styles available at JARO, Pakenham, Melbourne"
JARO has a large selection of bedroom furniture including bedheads, bases, blanket boxes, chairs. 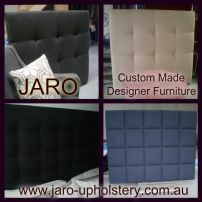 commented on "Designer bed heads or boards upholstered in gorgeous modern fabrics & leathers by JARO, Melbourne"
Make an appointment to see our stylish collection and quality fabric ranges.